Video of the general’s body returning to Iran. An Iranian Basij general, Jabar Drisawi, has been reported killed after clashes with rebel forces in the northern Syrian city of Aleppo. The Iranian Basij is a volunteer-based paramilitary force that is subordinate to the Revolutionary Guard Corps and the Supreme Leader Ayatollah Khamenei. Al Quds al Arabi, a London-based Arabic-language news site, says that Drisawi was there with other members of the Iranian Basij and Revolutionary Guard forces assisting the Assad regime in fighting the rebels and to “protect Shi’ite shrines in Syria.” Al Quds goes on to say that Iran has also “recruited militant Shi’ites from Iran, Pakistan, Afghanistan, Lebanon and other countries and groups loyal to Iran to fight in Syria and Iraq”. Other Arabic news sites have reported similar claims that Shi’ites from Central Asia have been recruited by Iran to fight alongside Hezbollah and Syrian troops. Just recently, the Islamic Front, a powerful Islamist coalition in Syria, reportedly captured a few Afghan Hazaras in Aleppo who were fighting alongside regime troops. Iran has been assisting the Assad regime in fighting rebel forces by sending their own troops into Syria. The Revolutionary Guard Corps, a powerful military force in Iran, is known to fight alongside Syrian troops. 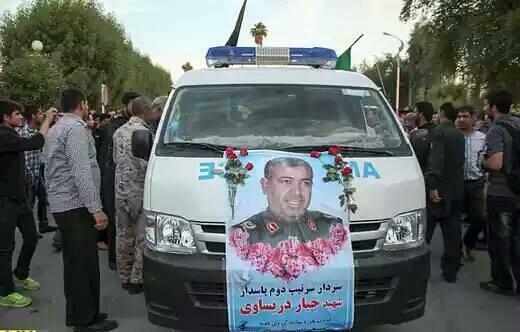 Last December, a commander within the Revolutionary Guard Corps was killed in Damascus. In June of this year, another commander was killed in Damascus. And in July, seven members of the Revolutionary Guard were killed fighting rebel forces. Some of these troops were likely part of the Quds Force within the Revolutionary Guard Corps. The Quds Force is a division of the Revolutionary Guard that is responsible for undertaking special operations outside of Iran. Hezbollah, Iran’s proxy in Lebanon, has also significantly intervened in Syria to assist the Assad regime. One less bad gut on earth…good kill ISIS…We need many casualties on both sides in Syria..
What an incredible barrel of spiders the middle east has become! It’s in the rest of the World’s interest to have the Sunnis-Shias come to the negotiating table at the end of this fight with bruises and humility.